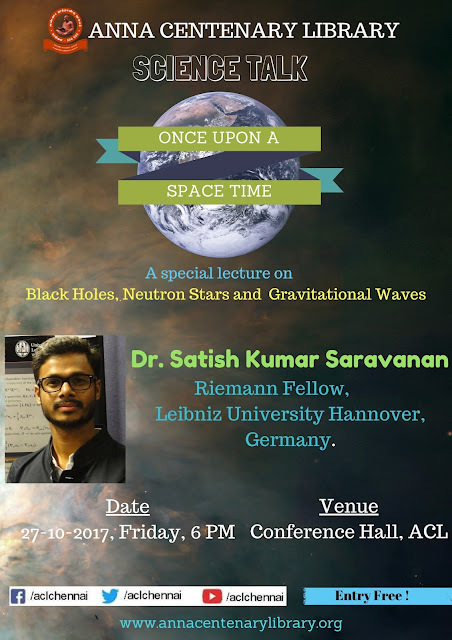 Anna Centenary Library organises a special Science Talk under the topic "One upon a space time" on 27th October 2017, 6.00 PM. Scientist Dr.Satish Kumar Saravanan, Reimann Fellow, Leibniz University Hannover, Germany will be the resource person and deliver a special lecture on Black Holes, Neutron Stars and Gravitational Waves. Entry Free ! All are welcome !